When I overhear conversations about workwear, I mostly hear people talk about all the fabulous clothes they can't wear to the office. But office-appropriate attire doesn't need to feel safe or boring, in my opinion. Workwear has changed drastically over the past decade, and there are a growing number of role models we look to when dressing for the office. The modern working woman has proven to be an endless source of inspiration for fashion brands who constantly rethink old classics, resulting in a more varied offer of office-appropriate pieces to choose from. Many online retailers are creating workwear-specific shopping sections, and we're even seeing brands that specialize in creating pieces for people who work a 9-to-5. "Women's clothes are much more varied than men's, so there is far more scope to stand out. For better or worse, this means that clothes can become a talking point, even when it's relating to a woman in a position or role that has nothing to do with fashion," says Polly McMaster, founder and CEO of The Fold, a London-based platform specializing in workwear. "Dressing in a way that can reflect the importance of their professional role but still allows for individuality and personality is key. The common theme is more around confidence, being smart and groomed and looking like you are showing up to achieve something great," she adds. A blazer is the kind of item that makes any woman feel like she can rule the world. A simple black blazer always does the job, but if you want something slightly more special, look for one with a twist, such as an interesting fabric, color, or button detail. A classic shirt is the perfect layering piece for any type of wardrobe. Layer underneath a blazer or add a turtleneck for an outfit that's not only winter-proof but also office-appropriate. Not that into layering? Pair a slightly oversize shirt with suit trousers. The key is to look for a style with expensive-looking details such as a slightly longer cuff or beautiful buttons. What do we look for in a work bag? Something that looks modern and office appropriate but also fits all the things you need to get the job done. We love a mock-crocodile leather bag, as it adds texture to simple outfits and feels chic. Opting for something simple? We recommend going for a large, plain tote bag that fits everything. 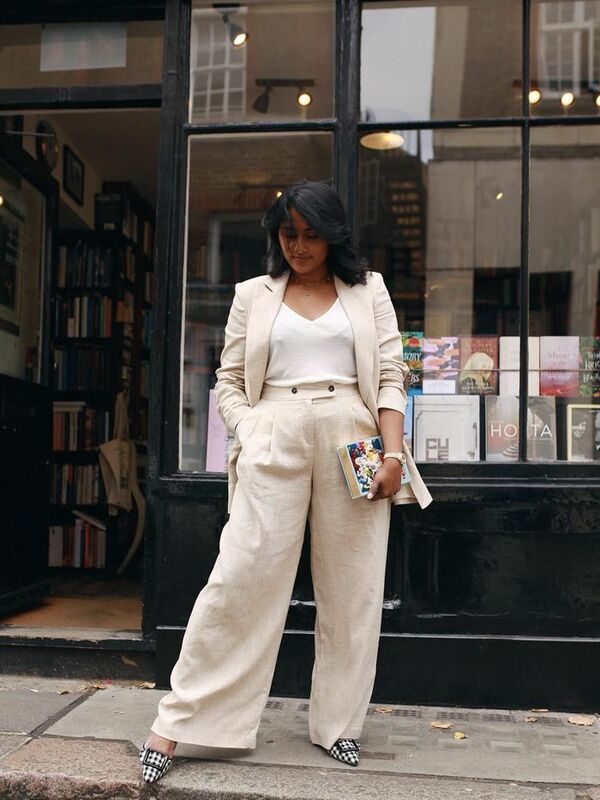 Wide-leg trousers are one of those items that will elevate anything you wear it with. Monochrome looks have been all over the streets and work very well for corporate environments. If I could only wear one thing forevermore, it would be a demure dress. I love how versatile they can be, but they're also a one-piece solution to looking the part. We strongly approve of the layering in the picture above. A perfect-fitting suit is the ultimate power combo. Pick one you feel comfortable in—whether you go for an oversize style or something more tailored. Wear with shirting to be classic or with a roll-neck for a modern update. To finish off your boss look, add a watch and layer with additional personal jewelry. The key lesson here is to not overaccessorize.